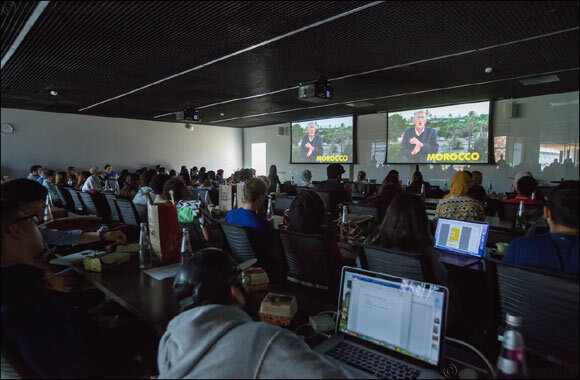 Doha, Qatar – November 13, 2018 – Journalists from the Pulitzer Center on Crisis Reporting discussed their experience reporting on issues that have a global impact and may be controversial to cover to students at Northwestern University in Qatar. Ian James, a reporter for The Arizona Republic, and Sharron Lovell, visual journalist and an educator based in Beijing, discussed work they have done reporting on the depleting water supply and the effects it may have on a global crisis. The journalists have produced multimedia projects with support from the Pulitzer Center about how water is being carelessly depleted or also how this finite resource is being mismanaged. Everette E. Dennis, dean and CEO of NU-Q, noted that the students at NU-Q benefited from hearing from working journalists who are able to provide them with insights on how to handle reporting on global issues, as well as learning more about these issues – including water insecurity. In a documentary James produced with Steve Elfers of USA Today, “Pumped Dry: The Global Crisis of Vanishing Groundwater,” the consequences of groundwater depletion in places around the world from India to Morocco were explored. James’ work has appeared on NPR's Morning Edition, the PBS NewsHour, and other radio and television programs. He also helped produce a 2014 series about climate change in the Southwest that won an Associated Press Media Editors’ Journalism Excellence Award for Digital Storytelling. Lovell meanwhile produced a documentary, “Drinking the Northwest Wind: China’s South North Water Transfer Project,” that focused on the millions of Chinese citizens who have been relocated over the past half-century to make way for hydroelectric projects, which has resulted in millions living in poverty. Lovell’s work has been published in National Geographic books, Newsweek, The Wall Street Journal, and Forbes among many other news outlets. In discussing the work that they have produced with the support of the Pulitzer Center, Lovell and James told the students that reporting on a global crisis requires that they do extensive research, be well prepared, and be culturally aware of the society they are covering. The journalists were accompanied by Pulitzer Center Executive Editor Indira Lakshmanan, an international and national correspondent, and columnist for newspapers, magazines, radio, and television. She spent a dozen years as an international correspondent for The Boston Globe from the Balkans and Latin America to Afghanistan and China and has been a columnist for The Boston Globe since 2016. NU-Q’s partnership with the Center also offers students the opportunity to apply for fellowships at the Center. Last year’s fellows – NU-Q students Ayilah Chaudhary, Isabella Palma-Lopez, and Amna Al-Baker – presented their reporting project on the persecution of Pakistan’s Ahmadis as part of the annual fellows weekend in Washington, D.C. in October.